"So what do you think of our village?" the elderly couple asked. "Salaam hon," we replied. "It's peaceful!" or more accurately "Peace is here." What can be more peaceful than a village where its elders gather to discuss business around a tree? What can be more peaceful than a village nestled between the hills with the fertile fields turned green by the winter rains? 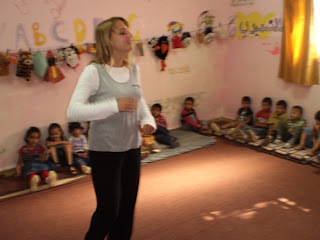 What can be more peaceful than a place where people want nothing more than for their children's dreams to be fulfilled. 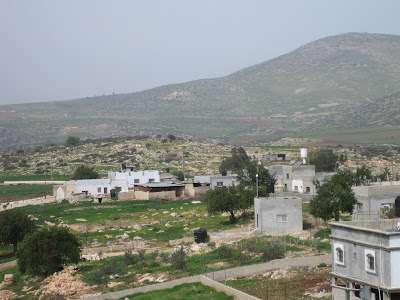 This is a blog about the village of al-Aqaba in the far northeast corner of the West Bank (not to be confused with Jordan's seaport Aqaba on the Red Sea or another Palestinian village Aqraba southeast of Nablus). For us al-Aqaba provided a welcome respite from the noise and clammer of the city, the fast-paced and stressful life of Jerusalem. The pastoral setting, the unseasonably warm sunny day, and the simple life-style of al-Aqaba can be deceiving. Peace here? You have to be kidding. When you hear the story of the last forty years or so (and we'll come to that later), you'll understand why many would hesitate to use the words peace and al-Aqaba in the same sentence. You'll understand why residents of al-Aqaba could remain pessimistic about the future. You'll understand why the residents of this small village would have every reason to be suspicious of visitors from the outside. Instead the welcome mat was rolled out for us. Ahlan wa Sahlan! They would teach us what it is that makes for peace. 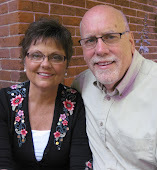 Why would this modern-day Abraham and Sarah not be suspicious also of us arriving at their "tent" unexpected? Instead they insisted that we sit down and rest a bit and share a cup of tea. "Try some of our fresh picked lettuce." "Now you need some coffee." We laughed watching their two grandsons play on a make-shift swing hanging from a shade tree. That was a topic we both understood, "And how many children and grandchildren do you have?" They more than doubled us. And then two more came walking home from school with their backpacks and a hunger for an after-school snack before starting their homework. Salaam hon! Peace is indeed here! For our visit to al-Aqaba we were accompanying one of our congregation members, Morgan, whose great-grandfather, as it turns out, was my seminary homiletics professor. We often describe our congregation as a servant-congregation--made up of a significant number of young volunteers who are here to serve for anywhere from three months to a year. 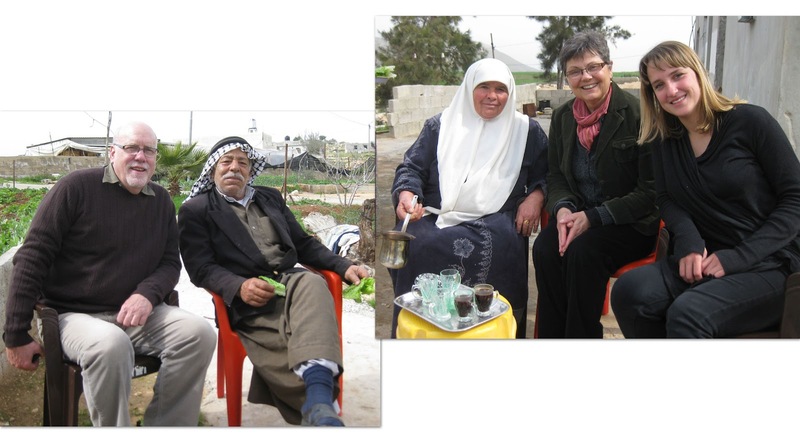 And on any given Sunday while we are engaged in Word and Sacrament in our Redeemer chapel, the majority of them are embodying Christ's love in the communities they serve in Jerusalem and throughout the West Bank from Hebron in the South to a place like al-Aqaba in the north. What is amazing is how they manage to get to church as often as they do, like Kathy from the Christian Peacemaker Team in Hebron, making connections via three or four buses, passing checkpoints, and various hurdles just for the opportunity of being in community. So on this past Sunday morning, when Morgan managed the long trek from al-Aqaba to Jerusalem for our Sunday worship, she mentioned that she had to stay in Jerusalem for an afternoon meeting. Gloria and I looked at each other and were quick to volunteer to drive her back in exchange for a place to stay over night and a tour of the village and a chance to learn about her work there. 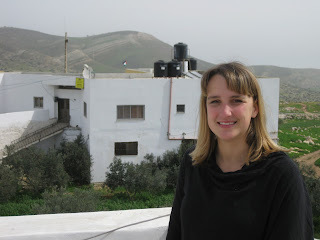 Morgan and the small guest house she manages for the village of al-Aqaba. 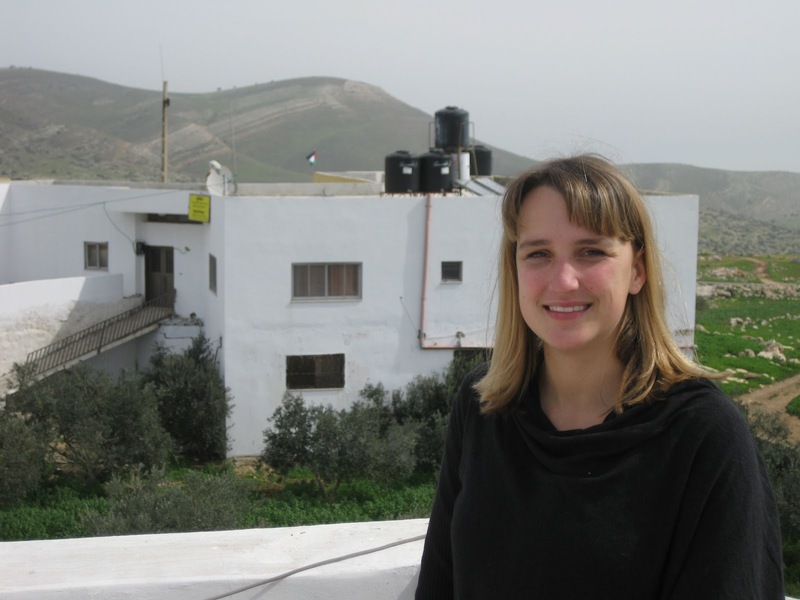 Morgan learned about al-Aqaba through an online search of Palestinian towns and villages where she might be able to contribute her talents to the life of people. An American-based organization called Rebuilding Alliance (click to read more) had assisted in building a school there and was looking for someone to teach English. In addition, Morgan assists mayor Haj Sami Sadeq in community development projects with a goal of bringing former al-Aqaba residents back to their homes as well as outsiders to visit this location off the beaten path. The message of welcome is the first thing visitors see. Today there are only 300 villagers who have remained steadfast, a drastic change from the mid-sixties when over a thousand persons enjoyed the idyllic setting. Then came the 1967 war and occupation. 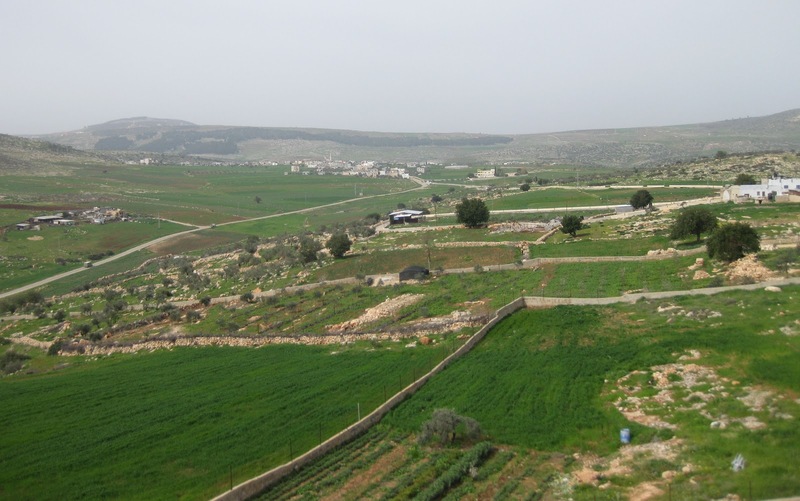 Unlike the rest of the Israeli Occupied West Bank where expanding settlements are the problem for Palestinian villagers, The Israeli Defense Force decided to use this part of Palestinian land for military camps. In the map below, al-Aqaba is in the center. Further to the east large military camps are designated by the reddish brown color. Eight smaller camps totally surround the village. 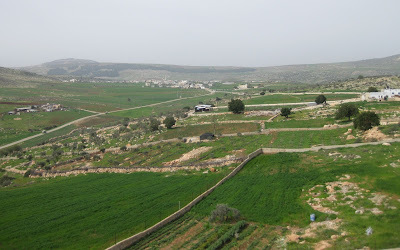 These include the elite ( = ruthless) Golani Brigade who carry out regular training exercises in these hills and, at times, within the village itself. Yes, you read that last sentence correctly. A military brigade that practices within an occupied village, among real live human beings trying to carry out their daily lives. The first "accident" occurred in 1971, when the then sixteen-year-old Sami Sadeq (now mayor) was helping his parents in the fields and was shot with three bullets. An IDF ambulance took him to an Israeli hospital in Afula where they were able to remove two bullets from his spine, leaving him paralyzed from the waste down. The third bullet remains lodged to this day next to his heart. The amazing part of the story was that Sami did not give up. He chose to remain to work through the system to help his relatives stay steadfast on the land. While in the hospital during those months following the shooting, he spent all his energies learning Hebrew to aid in communication. Over the years another eight villagers were killed and another fifty were wounded by the military exercises. 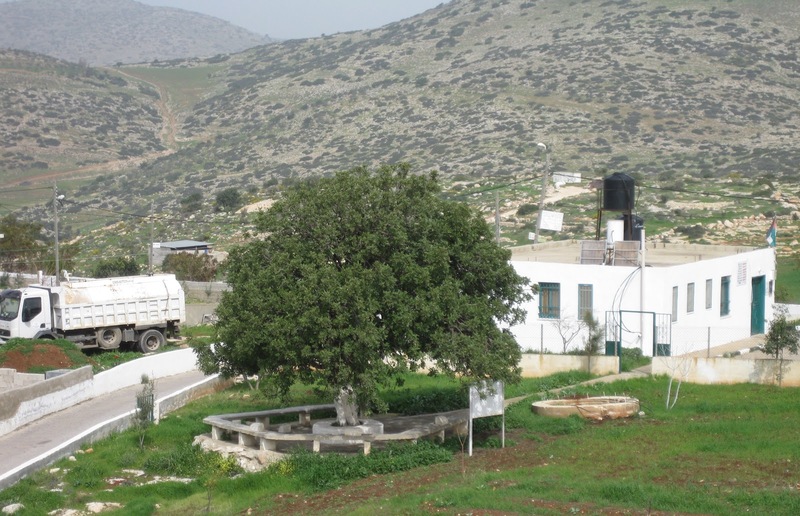 Perhaps the most bizarre story that we were told was that the IDF practiced night raids in the village itself to prepare for the 1982 invasion of Lebanon, because the village was similar in structure to many in Southern Lebanon. Not surprisingly, three-fourths of the residents moved out to the neighboring village of Tayasir or to the city of Tubas to the West. There was no compensation. They simply lost everything and had to start over again. How could they dream of peace under these conditions? That evening we spent in al-Aqaba seemed so peaceful, so quiet. The sleep was so restful until 3:00 in the morning when I awoke to the sound of gunfire. Another practice round for night time raids. I wondered what must be going through Sami's mind or the grandparents of the four children we met. Salaam Hon? Yet Sami has remained steadfast. And there have been small victories. After years of legal arguments and numerous appeals, the Israeli High Court in 2001 finally ruled that the military camps adjacent to the village on the west must be removed and that the IDF could no longer use the village for military exercises. The small hill in the photo below (just beyond the houses) was the site of one of those camps. Villagers feeling relieved and perhaps a bit optimistic, began rebuilding with simple homes that would be more than adequate lifestyles. They planted gardens and invited former residents to return. A morning walk around the village showed us signs of progress, houses just completed and foundations of others being layed. Salaam hon? Mayor Haj Sami Sadek felt they needed more than just new homes. If they were really thinking about the future, the key would be a kindergarten. Here is where Rebuilding Alliance entered the picture, offering educational expertise and funding to complete the building in 2004. 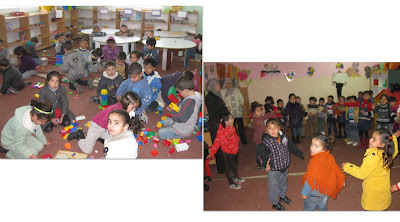 Click to see a Youtube video about the al-Aqaba kindergarten. It was a brilliant idea. There were no kindergartens in the villages located to the west. So every day school buses and private vehicles bring children to al-Aqaba, many of them families originally from the village. Today 130 students are enrolled in the kindergarten. As we toured the classrooms where the children were engaged in singing and in group play, the mayor was outside supervising another building project, a roofed playground for the children to play outside on rainy winter days. Nearby there is an elementary school. The positive court ruling and the progress taking place in the village paved the way for foreign governments to get involved, including funding from USAid for the paving of a road. The Japanese Embassy erected a new water tank and provided a truck (see photo of truck next to the meeting tree above) to bring water from a neighboring village (the old water supply had been destroyed by the IDF), the British Embassy paid for a clinic, and the Catholic Church is considering offering a plot of land for a birthing center. Japan, Norway, and Belgium provided funds to build additional floors on top of the kindergarten for economic development projects including a tea-bag factory and a sewing coop that exports dresses to Canada and the USA, where young women and men can find employment, and where mothers can coordinate their hours while the children are in school. And for the spiritual needs of the community Haj Sami Sadeq built in the center of the village a new mosque. Al-Aqaba still remains under occupation. This tranquill village, where grandparents love their grandchildren and where civic leaders place education as the highest priority, still lives under a system that strips away human dignity. This is occupation. Al-Aqaba may be located in the West Bank of Palestine, but it is in Area C, still fully under Israeli control. The first stage of the Oslo Peace accords divided up the West Bank into three zones-- the peace process never advanced beyond that first stage as Israeli settlements created new facts on the ground. 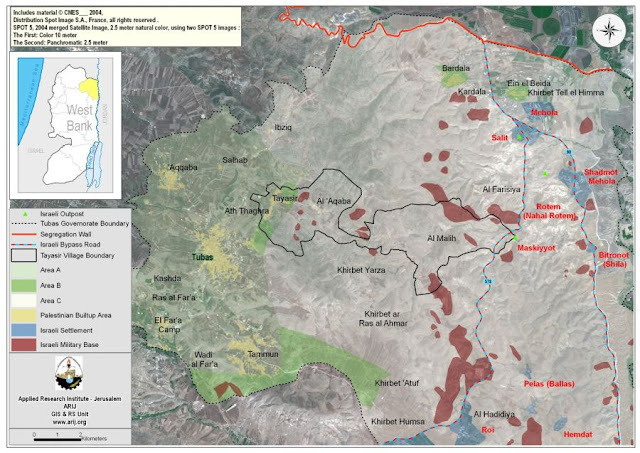 Area A -- the light brown color designates the 8 % of the West Bank under full Palestinian rule, mostly eight separate urban area. 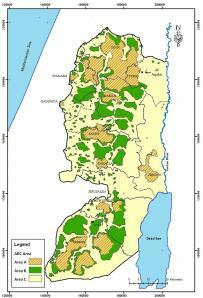 Area B -- the green areas make up about 30 % of the West Bank governed jointly by Israelis and Palestinians. Al-Aqaba falls in Area C, with Israelis making all the macro policy and decisions that affect the micro achievements of the village. This includes the continuation of military camps in the vicinity. 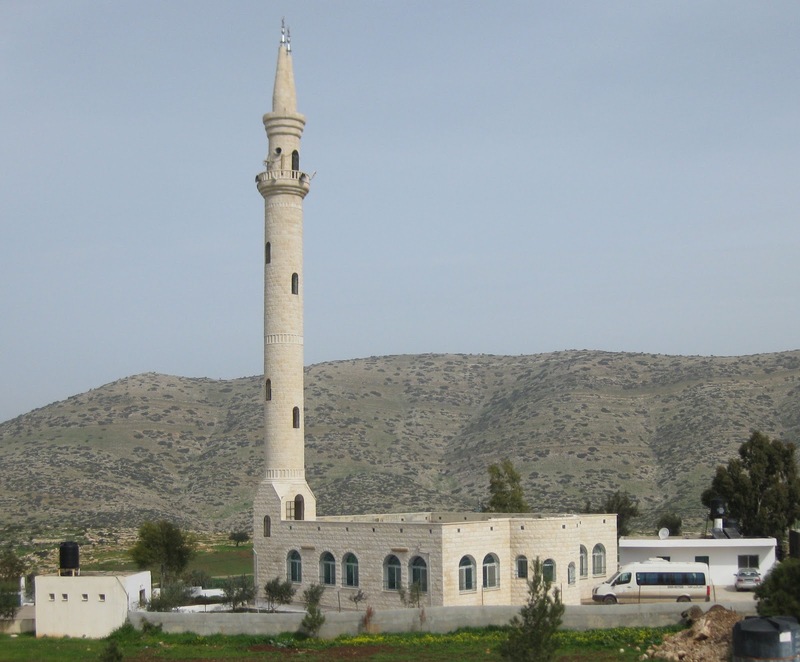 On June 6, 2006, a young Israeli soldier entered the village mosque at two o'clock in the morning, seemingly with the intent to wait until early morning prayers when he would empty his machine gun into those arriving for prayer. He had enlisted just two weeks earlier just after coming to Israel from Chicago. His platoon had been engaged in night military exercises 2.5 kilometers from the village when he slipped away to the mosque. Fortunately a villager had noticed his arrival and kept the worshippers outside until other soldiers arrived. What happened next when the soldiers entered is a matter of debate. The IDF declared the soldier's death as a suicide. Yet the villagers counted 106 bullets fired inside the mosque, damaging both the building and the body of the dead soldier. For more details see the Haaretz article. Incidents like this remain like a cloud hanging over the community. Most of the military camps still remain. In some ways this is not surprising. Currently, over 12,000 Palestinian homes in Area C of the West Bank and in East Jerusalem are under demolition orders. The official reason: they have not been granted building permits. The first demolition orders arrived already in 2004. Although the village continues to submit through legal representatives a building master plan, although the spacious valley can easily support homes numbering in the thousands, and although they have filed the proper papers for permits, they will likely never receive them because this is Area C.
Now with the latest demolition orders, 97 % of the village is under threat of demolition including the mosque, the domestic homes, the building of economic development, the clinic, and the kindergarten. The kindergarten is under threat of demolition! These are not empty threats. 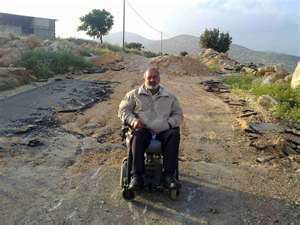 On Thursday morning, Sep. 15, 2011, without notice, Israeli military bulldozers demolished a home and water cistern in Al Aqaba, leaving 22 people, including 12 children, homeless. The military bulldozers also ripped deep trenches through Peace Street — for the 2nd time. It is easy to understand why the prophets Jeremiah and Ezekiel criticized those who went around exclaming, "Peace, Peace" when there is no peace. Yet the surprising thing is how the people of al-Aqaba village could convey a sense of peace so much stronger than the peace advertised by the strongest security systems in the world. Theirs is a peace that understands how to take in the beauty of God's creation. Theirs is a peace that knows how to relax over a cup of coffee and enjoy the day. Theirs is a peace that smiles at the gift of grandchildren. Theirs is a peace that welcomes the stranger. 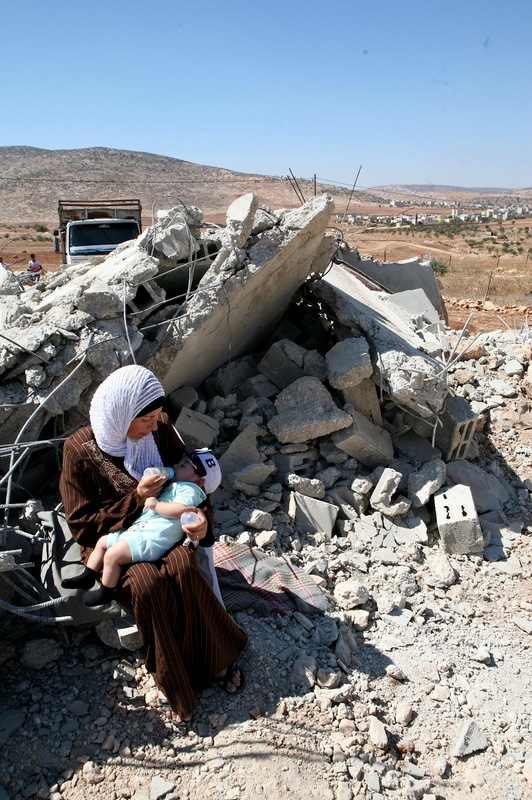 Theirs is a peace that builds houses even at the threat of demolition. Theirs is a peace that invests in children. Theirs is a peace that understands that the best alternative to machine guns, tanks, bombs is a kindergarten.